A rainy morning sent the 16s singles semifinals indoors, but the skies cleared and the Stowe Stadium courts dried to allow the 18s singles semifinals and both doubles finals to be played outdoors. Top 18s seed Michael Mmoh kept rolling along, beating No. 8 seed Trent Bryde 6-2, 6-1, while No. 7 seed Vasil Kirkov hit his stride midway through the second set and won 12 straight games to beat No. 6 seed Zeke Clark 6-4, 6-0, setting up the first meeting between the two Floridians. Mmoh opened up a 4-0 lead in the first set before the 16-year-old Bryde held serve and only one of Mmoh's service games went to deuce in the opening set. "Today, I served unbelievable," said Mmoh, who saved all three break points he faced. "Almost every serve was an ace, so I happy about that. I think my first serve winning percentage was really up there. I was definitely a little nervous. When I come out, and I'm expected to win, it comforts me a lot to know I can get a lot of free points on my serve, and the rest of my game kind of flows in after that." Bryde was broken in the first game of the second set, and couldn't convert the few chances he had to get back in the match. "I definitely didn't want to leave the balls too short," said Mmoh, who lives and trains at the IMG Academy in Bradenton. "He has good drop volleys, good feel, he's good with his hands. So I wanted to make sure I kept the ball deep, play really physical, and when I had the chance, be aggressive. He doesn't have the best movement, so I wanted to really get him on the run." Kirkov spotted Clark a 4-0 lead in the first set, unable to find his game. "I was nervous and I was kind of tired," said the 17-year-old from Tampa. "The night before, I couldn't really sleep and when I walked on the court I was nervous, shaking. So all that combined is not a good formula." But once Kirkov began to move forward and finish his volleys, Clark could not find a way into the points. Known for his ability to wear down opponents, Clark had no chance to do that once Kirkov committed to ending points at the net. But Kirkov knew of Clark's reputation as a competitor, so he was wary of getting too confident even when he had won nine games in a row. "At 6-4, 3-0, we had a long game on his serve and I had a couple of break points," Kirkov said. "I knew that if I had lost that game, it could have been tough, it could have gone either way. So I tried to keep my composure and get that game, and luckily I did." After Kirkov won that game with another of his many winners, Clark yelled out, "What am I supposed to do, man?" No one in the crowd had any answers for him, and two games later, Kirkov had advanced to the final, assured of at least a US Open qualifying wild card. Neither Kirkov nor Mmoh have every played a best-of-five match, so Sunday's final will be a mental and physical test. "He hits a big ball, has a huge serve, is a good mover," Kirkov said of the test he faces in Mmoh. "It's going to be very tough. Early, in the first games, you've got to find weaknesses, if he has any. He's got a huge serve, it's a huge weapon, so I've got to make him play a lot. I've got one more match, so I might as well put my heart out there and see what happens." Mmoh is looking forward to playing against Kirkov for the first time. "You don't see that much in junior tennis," Mmoh said of Kirkov's game style. "It's good to see. He's really talented, he loves coming in, he loves doing different stuff, loves slicing. It should be fun. My first best of 5 match, I'm excited." The 16s semifinals were immediately sent indoors to Kalamazoo College's Markin Tennis Center once the rain storms overnight lingered into the morning. Once both matches finished, nearly three hours later, the 16s final will be exactly the same as last month's Clay Court final, with Lukas Greif facing Jenson Brooksby. For top seed Greif, it was business as usual despite the change of venue, as he needed just an hour to defeat unseeded Matthew Tsolakyan 6-1, 6-3. Greif needed only 20 minutes to win the first set, with Tsolakyan, a hard-hitting left-hander, misfiring often. But in the second set Tsolakyan cut down on his unforced errors, making Greif earn every point. Down 3-2 in the second set, Greif saved a break point, then broke Tsolakyan at love. "I thought that was the turning point," said Greif, a 16-year-old from Indiana. "I got off to an early break in the second, up 1-0, and then I played a poor game to get broken; I didn't make a first serve that game. Then we held until 2-3 and he had a break point against me and I came up with some good shots. Breaking at love was huge, it gave me a lot of confidence going into my next service game. And then to break, not having to serve for it, was awesome." Tsolakyan did save three match points in the final game, but never had a game point, with Greif's relentless pressure eventually forcing a forehand error that ended the match. On the adjacent court, No. 10 seed Brooksby and No. 15 seed Robert Maciag were nowhere near the end of their first set, although Brooksby did serve for the set at 5-3 and earn a set point before being broken. "When I was up 5-3, he played four good games," said Brooksby, a 15-year-old from Northern California. "He was more aggressive and dictating the points. I just knew that I needed to keep the offense more. It was frustrating [to have a set point and lose the set], but he earned that game. He played well." After a long three-set win in the heat and humidity Friday, Brooksby welcomed the cooler atmosphere inside, especially after dropping an 80-minute opening set. "It's not hot in here, so that helped me for sure, keep my energy up," Brooksby said. "These indoor courts are pretty slow, I like the slower pace, the ball sits up higher. And I like playing indoors." The second set featured only two holds of serve, both by Brooksby, who took advantage of some ill-timed double faults by Maciag to get another 5-3 lead. This time he converted, despite falling behind 15-40, and the 10-minute break between the second and third sets didn't prove detrimental to his momentum. "He was making more errors and I was keeping the length and dictating the points better," Brooksby said. "I had a lot of confidence going into the third set." Maciag, who said he was experiencing shoulder pain in his quarterfinal match, continued to have difficulty holding serve, with double faults again leading to breaks in the fifth and seventh games. Brooksby closed out the match on his first match point, giving himself an opportunity to avenge his 6-1, 6-1 loss to Greif in the Clay Courts final. "I'm not giving many details about what I did in that match," Brooksby said. "But I think it will be much closer for sure. I'll be on top of my game, for sure." Despite an easy victory last month, Greif is not taking Brooksby for granted. "He competes so well," said Greif. "Every match he competes so well. He can place the ball wherever he wants. He doesn't have a powerful game, but he's smart on the court. It's tough and you've got to stay focused throughout." The 16s singles final is scheduled for 11:30 a.m. on Sunday, with the 18s final to follow. The semifinal and final rounds of the Feed-In tournaments begin at 9:00 a.m., with the third place matches in 16s and 18s singles scheduled for 10:00 a.m. Live streaming will be available at ustaboys.com. The doubles finals in both 16s and 18s were played at the same time due to the rain earlier in the day, and the possibility of more in the afternoon. No. 4 seeds John McNally and JJ Wolf, both 17-year-olds from Cincinnati, both committed to Ohio State for 2017, earned their US Open main draw wild card by defeating unseeded Sean Sculley and Nick Stachowiak 6-2, 6-3. Although McNally and Wolf won their last three matches in straight sets, they were by no means impressive in the early rounds. "We were down a set and 3-0, then in the third round we were down a set and a break," said McNally. "We were working on a lot of new things, which was the reason for that," said Wolf. "There were a lot of nerves, because it's Kalamazoo, but we overcame those nerves," said McNally. "We definitely grew as a team a lot," said Wolf. "Looking at us playing first round and us playing this last round, it's a completely different team. We weren't moving as a team in the beginning and there was a lot of singles play, but towards the end it looked more like doubles." McNally and Wolf got off to early leads in both sets against Sculley and Stachowiak, who are committed to Duke. Although Sculley and Stachowiak had several opportunities to break McNally and Wolf, they could only convert once, and McNally and Wolf had a two-break lead at that time. In the second set, McNally and Wolf held on to their break, but were unable to get a second until the final game. With Sculley serving, he fell behind 15-40, but it took a third match point for McNally and Wolf to seal the win, with McNally jumping into Wolf's embrace in celebration. Both McNally and Wolf lost their main draw singles matches in third set tiebreakers--McNally in the quarterfinals and Wolf in the round of 16--so a berth in the US Open main draw certainly eases that pain. "We both had such tough losses in singles," said McNally, "the toughest for me ever in my life, and I'm sure it goes as one of the toughest for JJ. I was pretty much down and out after that match and he picked me up. I picked him up after his loss." "We came right back out, ready to play," said Wolf. "Ready to play US Open," McNally added. In the 16s doubles final, No. 2 seeds Andrew Ton and Maximilian Wild captured the gold balls, defeating No. 11 seeds Maciag and Jared Pratt 7-6(5), 6-3. After a tough first set, in which there were no breaks of serve, Wild began the second set serving, only to fall behind 0-40. Five points later, Californians Wild and Ton had the lead for good. "That was the most important game of the match, I think," said Ton, a 16-year-old left-hander. "Even though we were down 0-40, we did like we always do," said Wild. "We stay composed, play every point." That composure came in handy with Wild serving at 5-3, match point. Thinking he had hit an ace on a first serve, Ton and Wild started celebrating, only to have the line umpire on the center service line give a late out call. "Right after we heard that call, we were a little shell-shocked at first," said Wild, 16. "We looked at each other and just said, focus in here. I played it as any other point, put the serve in, and I knew I had my partner up there at the net." After winning that roller coaster point, Ton and Wild were happy to reflect on how quickly they came together as a team. "We played together only once before, two weeks ago at Clay Courts," said Wild, who played with Ton in the 18s in that tournament. "We had an amazing win there over the No. 2 seeds, and we're best buddies. So it's a lot of fun out there all the time." "We have great chemistry, are always hanging out," said Ton. "It's not just on the tennis court, it's off the tennis court as well. It's just a fun time." "A big thing is Andrew is left-handed and I'm right-handed," said Wild. "That's a really big advantage in doubles for sure. But most of it is the chemistry. We're out there all the time jumping around, high-fiving each other, always positive together. That's definitely the biggest thing." Complete results are available at ustaboys.com. 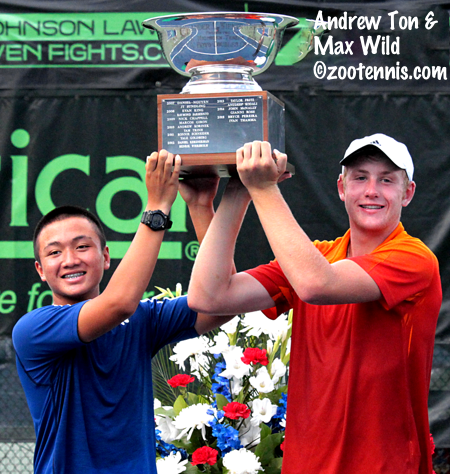 Champions were crowned in the other USTA National Championships this weekend. At the girls 12s, Katja Wiersholm, the Clay Courts champion, added a second gold ball to her collection. The No. 2 seed defeated No. 12 seed Vivian Ovrootsky 6-3, 6-3 in the final. At the boys 12s, No. 3 seed Victor Lilov downed No. 17 seed Braden Shick 6-4, 6-1 in the singles final. At the girls 14s, No. 4 seed Gianna Pielet defeated Sonia Maheshwari 6-1, 6-2 for the singles title. At the boys 14s, No. 1 seed Alex Lee beat No. 5 seed Jameson Corsillo 6-1, 6-3 in the championship match. In San Diego, No. 4 seed Nicole Mossmer won the 16s title and a US Open Juniors main draw wild card by defeating No. 17 seed Julia Haynes 7-5, 6-0 in the final. The girls 18s final will see top seed Kayla Day take on No. 7 seed Nicole Frenkel in a battle of left-handers, with the winner earning a US Open main draw wild card. Day defeated No. 17 seed Carson Branstine 6-0, 6-1, while Frenkel topped No. 5 seed Amanda Anisimova 6-3, 6-4. The girls 18s doubles final will feature No. 5 seeds Jada Hart and Ena Shibahara against No. 9 seeds Meible Chi and Taylor Russo, with the winners earning a US Open main draw wild card. The girls 16s doubles title went to No. 9 seeds Andrea Cerdan and Christina Hand, who beat No. 2 seeds Chloe Beck and Emma Navarro 4-6, 7-6(6), 7-5.